Stressed out does not even begin to describe how some of the Chasemates are feeling today. The tension in the air inside of the Big Brother House was so thick that you could cut through it with a butter knife. Earlier in the day Head of House Elikem got the most votes from his fellow Housemates during Nominations. This evening he used his 'Save and Replace' power to shield himself and throw Angelo under the bus. This means that the South African is up for possible Eviction this week along with Bimp and Dillish. Today's Nominations were the most emotional of the season, all of the Housemates know just how crucial this week's Nominations are; as they are the last of the season. As soon as Elikem came out of the Diary Room there was visible worry on the Chasemates’ faces as no one feels safe right now. Straight after the Live Nominations wrapped up; a stressed out Dillish and Bimp headed into the bathroom to console each other. "I am being Chased," exclaimed Dillish. The fates of Angelo, Bimp and Dillish in The Chase are now in the hands of Africa. Who will make it to the top five and whose Chase is coming to an end this Sunday? 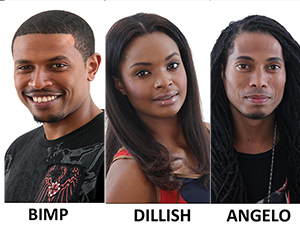 Angelo, Bimp and Dillish are up for possible Eviction this week. Vote to keep your favourite Housemate in the game. ANGELO all d way .WINZO Swaziland. Bimp all the way. Course east africa say so. Bimp, jentil man, u r safe!!!! Play ur game!!! Zambians open ur mind don't vote Angello it's be gut 4 Cleo!!!!! Even if u try to safe him ending with 4 countries vote bcoz u sa ur very stupid in sadc u help who?,?? ?only bots n zam!!!!!!!! Angelo our own inlaw is going no where. Melbevangelo till the end, but the money is Melvin's.Team Benue State Naija. because he's a threat and competition to Melvin's game. Malawians are voting for bimp trust me.wats sk special with this sugardad angello with no digninity at all. Guys, let's take IK's advice... Vote wisely. Let's vote Dillish and get rid of competition - Bimp and Angelo! Dillish all d way.......Africans pls vote wisely. Dillish goooooo we don't want you, you've been using our guy to get vote and you not even afraid for saying it out. Its now the dying minutes save e weak one to avoid more competition especialy those countries w represantatives in top five so i say dillish coz come what may she wont take e money home so for e sack of my county to have chances of winning Angelo and Bimp out coz u r competitors. Bimping all the week !